D is one of the most infamous vampire hunters in the land. Like the wandering hero in a Western, he travels from town to town on his powerful steed, wrapped in a cape, sporting a large brimmed black hat and a physics defying sword across his back. His presence is always noted as his look is iconic for a certain age of anime fans. D is also a dhampir - a half human, half vampire and is perhaps one of the most powerful vampire hunters. He does not care for "his own kind" and sets to work with a single-minded determination that won't stop until all vampires are exterminated. Charlotte Elbourne, the daughter of a wealthy man has been kidnapped by Baron Meier Link, a powerful vampire, and the services of D are retained for a significant sum. It looks like a powerful vampire lord and his bodyguards stand between D and Charlotte. To tip the balance in favour of a positive outcome The Marcus Brothers have also been hired. Beset by opponents on all sides has he bitten off more than he can chew on this mission? When the film opens it's late in the night. A full moon shines over a silent village. It's clear that they have had vampire problems - crosses adorn walls and roof-tops. Through the cobbled streets, a large ornate carriage is being pulled by four powerful black horses. As is whizzes along the streets the crucifixes bend and break as if some malevolent power resides in the carriage. A lady lies terrified in her bedroom. The window opens as if an invisible servant is inside and the flowers placed by it, red roses, wilt and die as if they have just been breathed upon by some creature. As the mirror breaks the woman is lifted from her bed. It is clear that in this world there are creatures who roam the night who have no reflection. The townspeople need help- and quickly- to make the streets safe again and there really is only one candidate for the job. 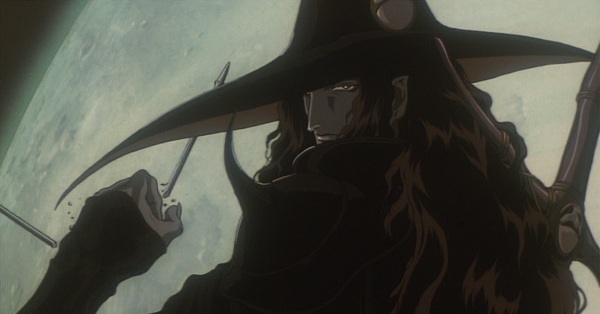 Vampire Hunter D Bloodlust is a wonderful mix of imagery and genres which, on paper, comes across as throwing things at a wall and seeing what sticks. D lives in a post-apocalyptic world thousands of years in the future. Some kind of cataclysm has occurred as humanity lives in a world where the Wild West of the 1800s has been smashed into a Hammer horror. Humanity lives is a mix of verdant European like villages and desert Wild West towns where on the surface everything seems ... normal. You don't have to look too far to see the monsters hiding in the shadows and preying on the weak. There are nods to a technologically advanced civilisation but it is not clear what happened. Was the downfall caused by the powerful vampire lords that roam the lands in horse-drawn carriages, or the zombies and beasts that make areas no-go zones for the ordinary citizen. Or did humanity do it to itself? Like the old wild-west Sheriffs vampire hunters roam the lands who, for a fee, will make the world a safer place. From the outset, VHD Bloodlust is an exceptionally gorgeous feature to look at. It is one of those shows where any frame could be mounted on the wall. Some scenes are prettier than others but Madhouse once again hits it out of the park. I struggle to think of a scene that stood out because it was not up to the same standard or quality as the rest. The director Yoshiaki Kawajiri (who directed Ninja Scroll and a favourite of mine Cyber City Oedo 808) perfectly blends science fiction, spaghetti Western and horror to create a stylish ... dark Disney-like film. Disney films are renowned for their quality of animation, design and music the world over. In VHD Bloodlust there were moments when it felt like I could be watching darker moments from a Disney animated fairy tale. The backgrounds are simply stunning and evoke a sense of recent destruction and of the world being rebuilt. We go from towns to homesteads, forests to deserts, mountain passes to stately expansive manor houses. At no point does it appear any shortcuts have been made and pausing any frame you could spend ages looking across the details on display. The animation is so fluid and there is much on display from scenes that appear on face value to be simple - D flicking stones to observe the defences of a building, to the aforementioned horses galloping across the desert plains. This is an action film and it is very kinetic. A lot of this appears in glorious set-pieces like a rain of arrows falling on a zombie horde (with D just plucking from the air the one meant for him) or a motorised uni-cycle attack on the hidden safe-house of Meier Link. In this scene one of the Marcus brothers careens across the landscape, shoulder-mounted rocket launcher prepared to fire. What else would we expect from Kawajiri? I was fascinated by the world and the characters I met along the way. I would love to find out more about D, his history and the mythology of the world. Because of that, I want to read the books written by Hideyuki Kikuchi (which are available in English) and it would give me a chance to look at the watercolour art by Yoshitaka Amano (which is also really pretty). On his travels are hints of his other adventures and it teases questions around who are the real monsters? In these moments you can see how vampire stories have stood the test of time and have been used to reflect the society of the time. The final inevitable battle between D and Meier Link is savage and poignant with both fighting for their right to exist. Its outcome was not a foregone conclusion and neither was it something I was expecting. I certainly wasn't expecting some of the more heartfelt moments to have the impact they did. Woven within an action film was a truly human story about love and relationships that all comes together in the final act. Whilst this is a slight change of pac,e all of the seeds for this has been planted earlier so it doesn't feel out of place. In fact, the more emotional heartfelt or thoughtful elements caught me a bit by surprise. On reflection, there were quite a few throughout the film and they turned what could have been a decent 2D action-er into something much more three-dimensional and memorable. 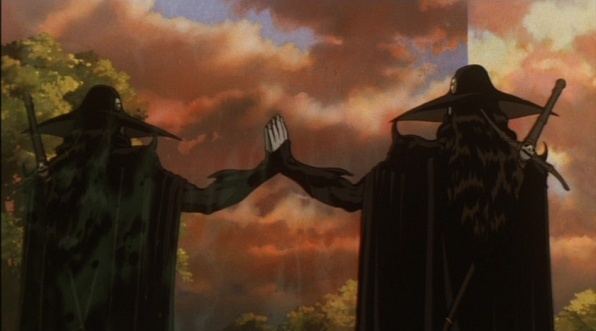 There was the Vampire Hunter D anime of 1985 to which this is a spiritual sequel. It is not clear where this fits in the timeline and where the former is more action-horror and, although D is iconic, it's pretty forgettable. It is very of its time in look and tone. VHD Bloodlust, however, is one of those anime that I would recommend others to watch. It's a good sci-fi-Western-horror action film. Aside from some of the facial designs, there are very few of the "anime tropes" which I think makes it more accessible if you are looking for pure entertainment. Thinking more about it, VHD Bloodlust is very close in tone and style to a Western production. Its 100 minute run time is filled with set-pieces, appropriate exposition, world-building, mood and tension building sequences. 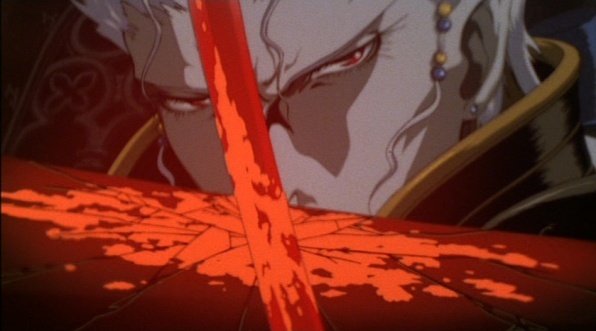 Vampire Hunter D Bloodlust is an engaging, stylish and polished production. With his big hat and his almost physics-defying sword D is still an enigmatic and iconic character who will bring back memories for fans of a certain age or generation. What could have been a rather run-of-the-mill rescue mission is given a competitive edge with the other hunters and expands on the mythology of the vampires within this universe. Sometimes they appear more human than those D meets along the way. Bloodlust is another example showing that Madhouse are a studio consistently delivering high quality animated features. There is oodles of scarlet and crimson on display and each outing for it is treated with a sense of fun but also rooted in some internal logic in the feature. Perhaps most surprising were the emotional moments Bloodlust presented and this turned a good action film into something a little more well rounded. IN A NUTSHELL: Bloodlust is a gorgeous sci-fi horror Western with bite.